Back when I was racing in the AMA 250 GP class, Bridgestone started building 500 GP tires, and about six months later we got new tires for my AMA class that were clearly better. GP racing really did lead to better tires for regular racers. One of the main reasons we use radial tires is that radial tires flex more than bias ply tires, giving a larger contact patch. More rubber doing the work means more grip and longer life (wear is spread over that larger contact patch). Tire companies long ago worked out how to make a radial tire keep a round profile so the bike can lean nicely. But it turns out there is a problem with the big flattened-out oval contact patch, i.e. the center folds away from the ground leaving you with, sort of, an oval shaped donut (see illustration). Bridgestone’s “GP Belt” pushes back against this center folding giving you the large flat oval you want. I asked how they figured out that the contact patch was folding away, leaving less contact pressure in the middle. It turns out Bridgestone has a machine that can measure the load of the tire contact patch. I think the difference between an oval donut and an oval pancake is clear enough for us to get the idea. So, how does it work on the track? It’s relatively easy to make tires and suspension that work well when the suspension is loaded. Just think about how loose you feel when you coast around a turn. Stabilizing the tires and the suspension by braking or accelerating is the best way to make any bike work well. But in the real world we often ride on roads and tracks for the first time and we make mistakes, i.e., we get into turns too hot or too slow. Sometimes we even miss a shift. So there I was riding an open-classer for the first time in many years on a new track after a long flight, a late dinner and less sleep than I wanted. In the first session, lots of coasting, lots of line corrections. These tires don’t care. The standard I want is to know what the surface is doing without being moved off line by any bumps or dips. I want to feel the road without being pounded by the road. This requires just the right amount of flex in the sidewall to take the edge off the bump, letting the suspension deal with the height of the bump but not all of the abruptness. The larger, more uniform contact patch spreads out the work of the tire and makes life better. In the afternoon I rode the new R1M on Bridgestone Racing Battlax V02 slicks. Rear tire size went up from 190 to 200. This tire also has the “GP Belt.” Except for a slight increase in the effort of changing direction caused by the larger rear tire, the slicks had the same feel as the DOT’s. By feel I mean how much I know about the surface I’m riding on. Sure, the slicks offered more grip and I went faster with them (and with greater track knowledge). But the bumps and the rough bits of the track felt the same. Per the R1M GPS data system, I was doing 159 mph at the end of the front straight in 6th, medium braking, back two gears, ease off the brakes near the start of the curbing, steady throttle (107.5 mph) until I can see the apex at the end of the curbing, roll the throttle all the way open. All along the curbing the surface is roughed up from the cars. In this one turn I’m doing everything you can, braking, down shifting, leaning, accelerating. The tire is flexing to give a large contact patch and to take the edge off the bumps … making the suspension’s job easer. The GP Belts are resisting the donut shaping. I love the feel I am getting from the tires, I pick my line and the bike goes there. What more could you ask for? Here are the tires we tested in the morning (R1) and in the afternoon (R1M) at Eastern Creek. A track compound version of the stock Bridgestone tires were used, the Bridgestone RS10 Type R (DOT Race tires). The standard tire the motorcycle is equipped with is the Bridgestone RS10 (Semi High Grip Tire for street and track use). The stock rear tire size is 190/55/ZR17. Bridgestone VO2 (Slick Race tires) were used for our event. 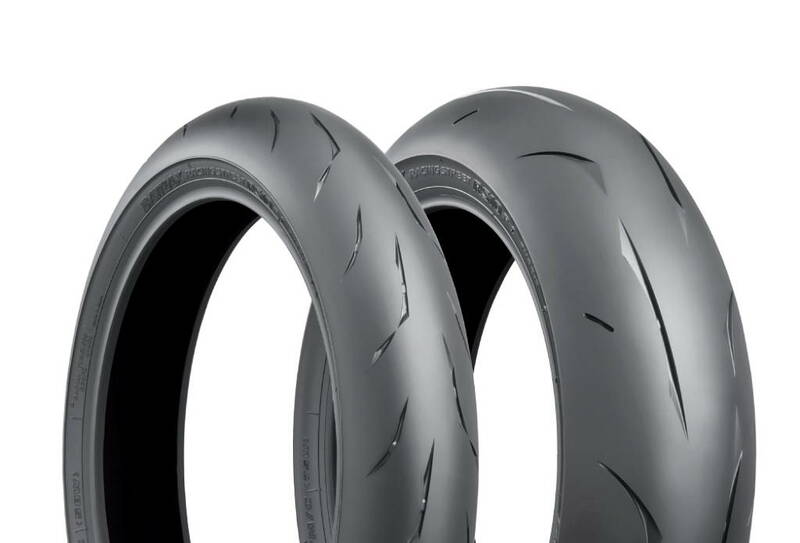 The standard tire the motorcycle is equipped with is the Bridgestone RS10 (Semi High Grip Tire for street and track use). The stock rear tire size is 200/55/ZR17. What pressures were you using on the RS10 for the track hot off the warmers? Don’t know. All that was taken care of by Yamaha/Bridgestone staff. Three groups of journalist riding the same bikes every hour. No chance for us to make changes and I was doing a story on the bike. Good question and i should have asked. Always start with the recommended pressure, then adjust from there for your conditions and keep notes. 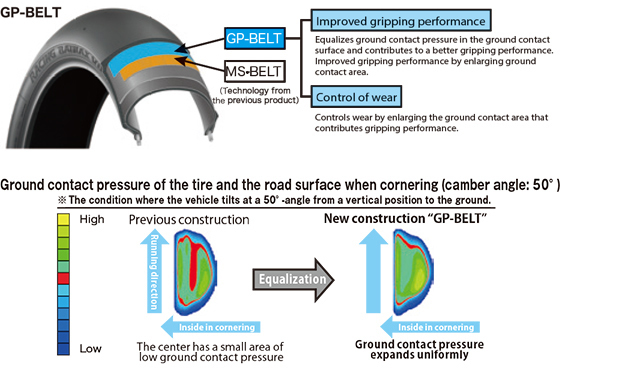 What is your(readers)idea of how Bridgestone made a belt that pushes on the center of the contact patch without pushing too hard around the edges? Hint, I don’t know Hisao just smiled when I asked. Ed: thanks for the write up. Am I to presume the non ‘R’ tires that came stock with the bikes have the GP belt too? I have owned a red model for one week and can attest to really good bump absporption by the stock RS10 tires. They do. Lets see a photo of you and your R1. Ok I’ll send a pic as soon as I get back from visiting my mom for Easter . Thanks for answering! Got the photo Vince, you and the bike look good. Dirck says they should have a reader page soon. Till then I’ll post your photo on my FB page. Wish tire makers would put more tread depth indicators closer to the tire center for street riders. Street riders might want to consider a more appropriate tire if they are worried about flat spotting the center that bad. I just ride until the cords show. Cords are pretty good wear indicators. Yeah, they indicate you’ll wear some bandages and a cast. You just have to choose between your tire cord showing order spinal cord showing. It’s really not that difficult.